A stolen hot dog from a gas station in Ohio led to a brawl. A woman was in line when she saw another woman steal a $2 hot dog. 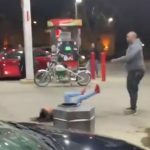 She told the thief that it was a bad idea since the gas station had cameras, but the woman and four of her friends assaulted her. When the fight went into the parking lot, a man tried to help, but he was also attacked. The women threw a trash can lid at the man, as well as a gas hose, and a squeegee. The women fled the area before the police arrived and haven’t been arrested at this time. The police report says that the women are facing charges of criminal damage, assault, disorderly conduct, and theft of a hotdog valued at $2.